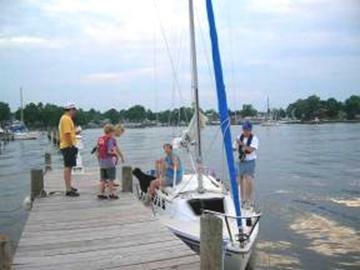 The 2007 Cruise started on Saturday, June 23 with a picnic at Maryland Marina, but the adventure actually started several days earlier for most of the sailors. Tony and Kim came from Melbourne, FL. 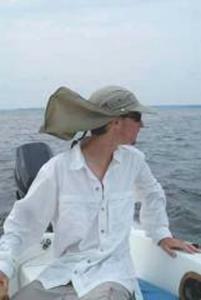 Peter single-handed his Catalina 22 from Oxford, MD. Dave and Laura, and Patty and Ken came from near Pittsburgh, PA.
Tom and Loretta came from Solomons. 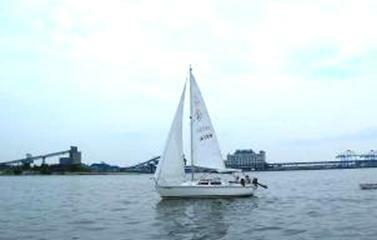 (Many other members of the fleet joined us later in the week, so keep reading). Kim distributed the t-shirts that Tony had designed. Everyone loved his design. 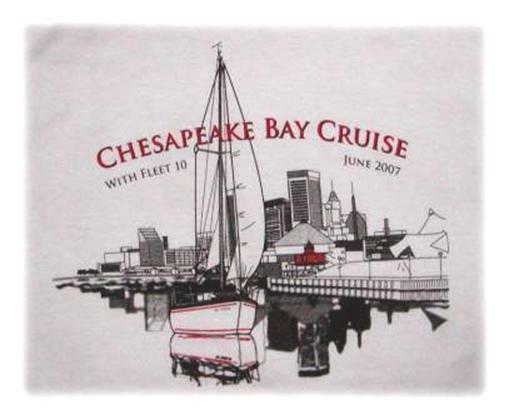 This year, Tony’s design featured Baltimore’s Inner Harbor and a Catalina 22. 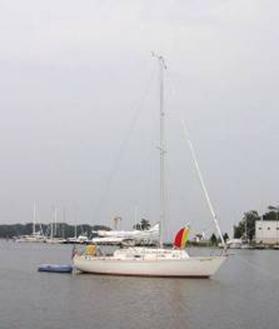 On Sunday, we sailed to Rock Creek off of the Patapsco River, a distance of approximately 13 NM. 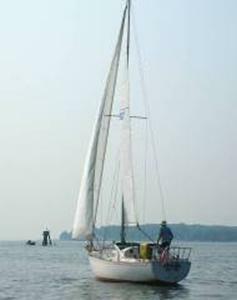 Actually, we sailed out of Middle River, but the wind died, and we motored from the northern end of Hart and Miller Island to Rock Creek. 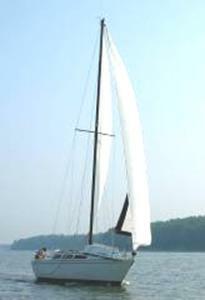 We had several radio checks on the way to the Patapsco, but the best one was when Grace replied from Wanderer III. 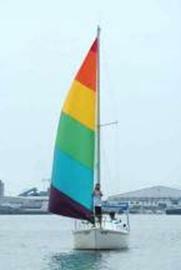 Dan and Grace’s departure from Philadelphia had been delayed by a problem with a pulley at the top of their mast. Hearing them check-in was one of the best calls we have ever received on our radio. 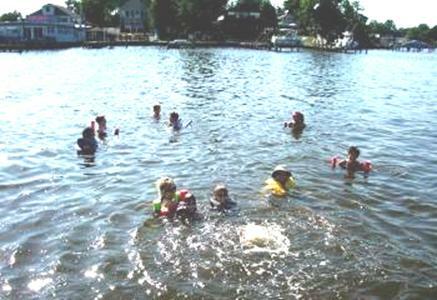 When we got to the anchorage at Rock Creek, many of us went for a swim. 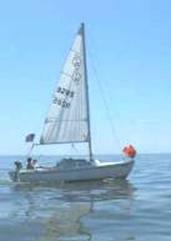 Along with Dan and Grace, Beverly and John on Seahaven also rafted-up with us. 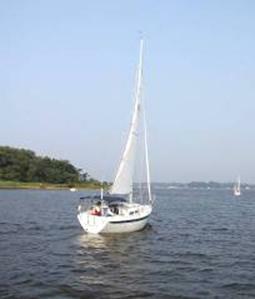 Some of us went to dinner at Windows on the Bay Restaurant, water-taxied in by Beverly and John and Lucy. 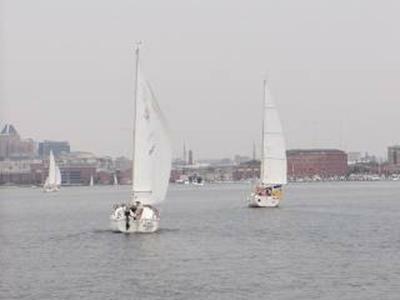 On Monday, we sailed to the Inner Harbor Marina of Baltimore (approx. 10 NM). 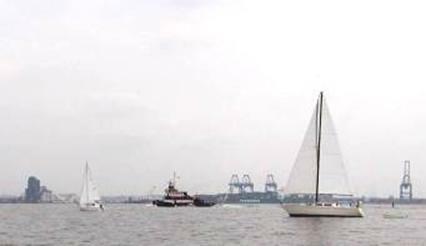 The sail there was exciting, and most of the boats of the fleet stayed close together. This allowed us to take some photos of each other with Baltimore in the background. 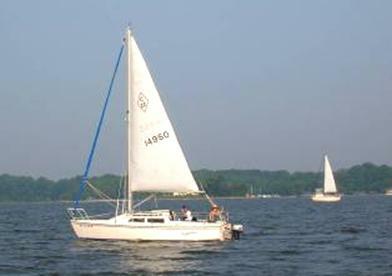 Danny sailed with Peter and this made for an exciting sail for me because our two C-22s, 9285 and 9558, were very evenly matched. 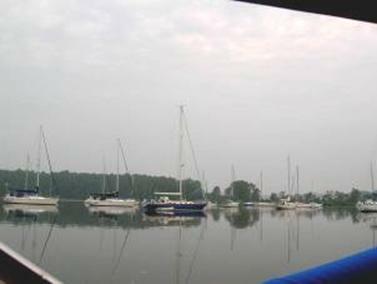 We were joined at the marina by Richard Weills and Pat Harris on Shaba. 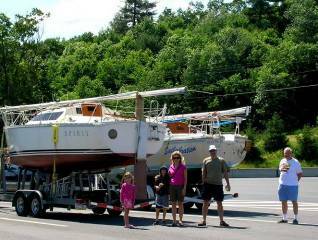 They had a propeller shaft packing problem that delayed them, and kept them from joining us until we reached Baltimore. In Baltimore we went to the Farmer’s Market. Dave, Laura, Eric, and Mia went swimming, and to the Aquarium. 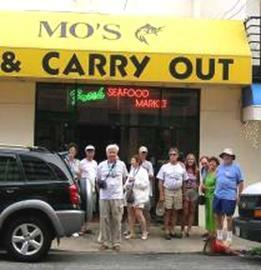 Many of us ate Crab cake dinners from Moe’s Seafood. At a little park in Little Italy. 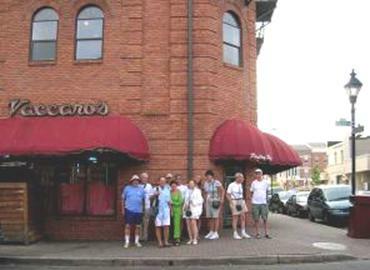 Then we had dessert at Vaccaro’s Ice Cream Shop Pastry Shop. That evening, we put Danny onto the light-rail train, so that he could return home and go back to work at his summer internship. 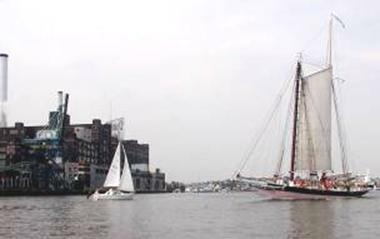 The plan for Tuesday was to sail from Baltimore to Back Creek. 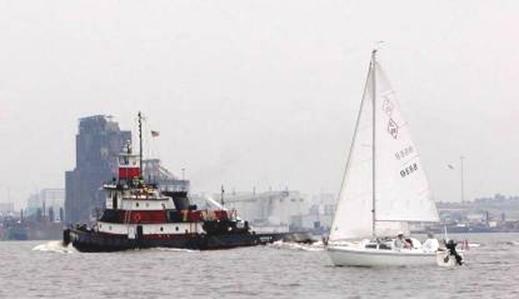 The sailing was great, beating out of the Patapsco River, until we got to the Francis Scott Key Bridge. When we turned around and saw that the sky was getting dark around Baltimore, we started the motors and got on the radios and headed back into Rock Creek instead of Back Creek. Tony and Kim practiced sailing to the raft, since they had a little problem with their motor that Tony quickly fixed once Sweethaven was tied to the raft. 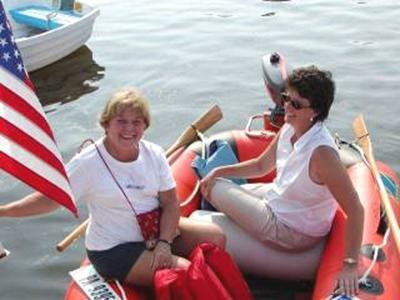 Later, Alice entertained everyone when she started our dinghy motor on Patty and Ken’s dinghy, and spun it in circles until she got everything under control. Eric tried crabbing with the 5 lbs of chicken necks that he had, but did not have any luck. 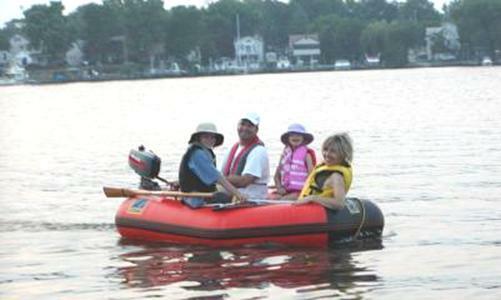 Later, Dave, Laura, Eric, and Mia went for a dinghy ride around the anchorage. 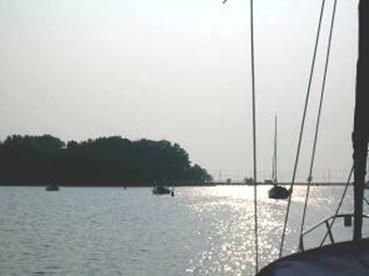 On Thursday, we sailed across the bay to Rock Hall and stayed at the Sailing Emporium. 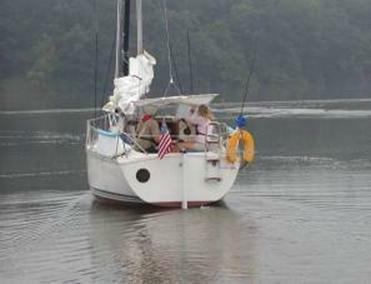 We sailed early, because afternoon storms were forecasted. Many of us went into town soon after we arrived. That evening, we had a picnic at the picnic area, organized by Loretta. Actually, Loretta organized almost all of the evening meals because she enjoyed cooking on her boat for us. We think that she also considered it a personal challenge to use up the huge amount of leftover baked ziti from the opening picnic. That evening Tony and Kim renewed their wedding vows. Many of us went for an evening swim in the pool until it got dark. The storm that had been predicted earlier did eventually hit Rock Hall and most of us waited out the storm in the marina’s meeting room. We could look down and see the wind and waves hitting the boats in the marina. I’m sure that this has happened to us at least once before at Rock Hall. 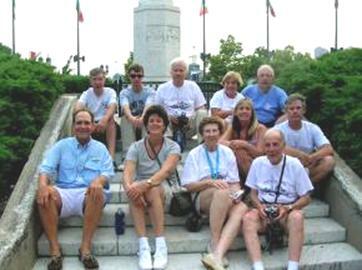 The next morning, Laura, Eric, Patty, Ken, Alice, and I rode bicycles into Rock Hall and had breakfast at an inn. On Friday, Peter left for home since he had to prepare for his upcoming trips to California and Russia. 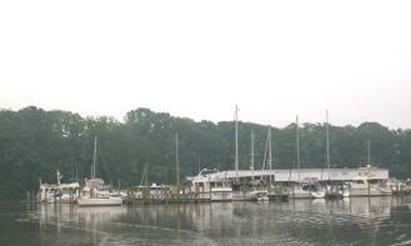 The rest of us sailed to Worton Creek and stayed at the Worton Creek Marina, approximately 14 NM away. There was little or no wind, so we had to motor to Worton Creek. 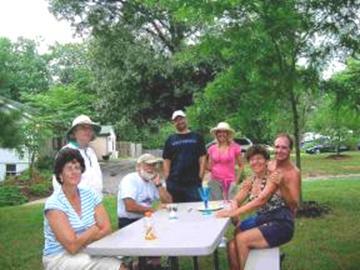 We had a potluck picnic near the pool above the marina, again coordinated by Loretta. After dinner, many of us walked around the marina and looked at the strange collection of boats being stored there, or being worked on, including a PT boat, and a huge multi-million dollar motor yacht that was being repaired after a fire. Patty and Ken and Alice and I checked out the bar of the Harbor House Restaurant. 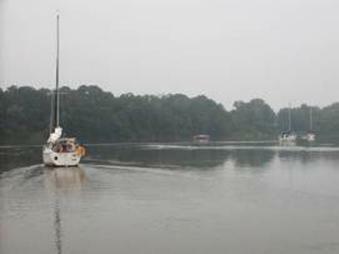 Early Saturday morning, the boats headed out of Worton Creek through the mist. As always, the company was great for the cruise. It certainly is a challenge getting people as busy as our fleet members together at the same time. 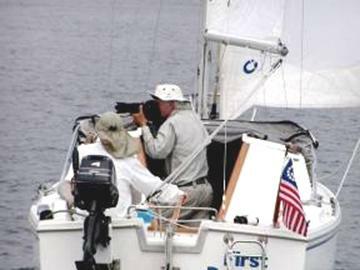 As I mentioned, many of the sailors had mechanical challenges with their boats on the way to the cruise. The weather was hot, but we certainly have seen days that were much hotter on past cruises. 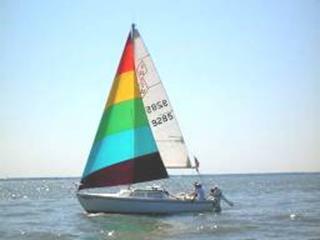 We were never hit by storms while on open water, and we did get to sail our boats on most of the days. 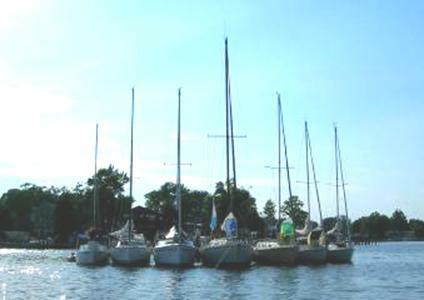 We were flexible when we sailed into Rock Creek for the second time, instead of sailing to Back Creek off of Bodkin Creek, as had originally been planned. 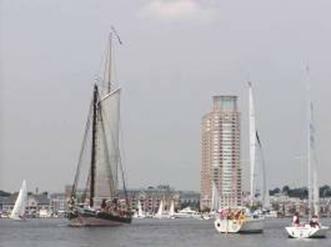 We did sail together, especially into Inner Harbor, which for me is always one of the most enjoyable parts of cruising with the fleet. I would like to thank Patty and Peter for sending photos to me to include with this message. I would also like to thank Alice for all her work planning and coordinating the cruise, and her work making the reservations at the marinas, and her frustrating work with the restaurants.